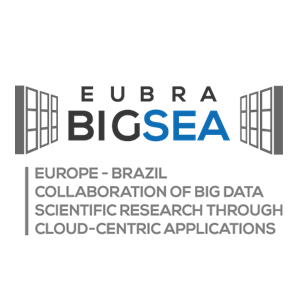 EUBra-BIGSEA is a project funded in the third coordinated call Europe – Brazil focused on the development of advanced QoS services for Big Data applications, demonstrated in the scope of the Massive Connected Societies. EUBra-BIGSEA is developing a QoS architecture that will predict resource consumption of Big Data Analytics applications in order to pre-allocate and dynamically adjust virtualized infrastructures. EUBra-BIGSEA will leverage mixed horizontal and vertical elasticity on hybrid container and VM infrastructures to support a rich Data Analytic framework powered by OPHIDIA, COMPSs and Spark, which will be enriched with these capabilities. EUBra-BIGSEA is an API-oriented project (that is, it is oriented to service and application developers). It will ease the development of Data Analytics application and it will provide improved performance and better usage of resources, as well as a sound framework for implementing privacy policies. EUBra-BIGSEA will be demonstrated on a data-intensive use case on traffic information prediction and recommendation from the municipality data of Curitiba, in Brazil. The final application will target general citizens, who could have a predictive information based on climate conditions and historic data. Furthermore EUBra-BIGSEA is an international initiative, designed to create and reinforce international cooperation between Europe and Brazil, and will contribute to technology and knowledge exchange between the two. Trust-IT leads communication, engagement and community building, including strategic planning and impact assessment. It is also driving the analysis of past and future EU-Brazil policy co-operation and the impact of joint collaborative work on cloud computing and big data. Trust-it is also responsible for the strategy for exploitation and sustainability and for creating new business models. We bring our expertise in standards to support the implementation and testing of standards to make the cloud infrastructure interoperable across different systems and borders.